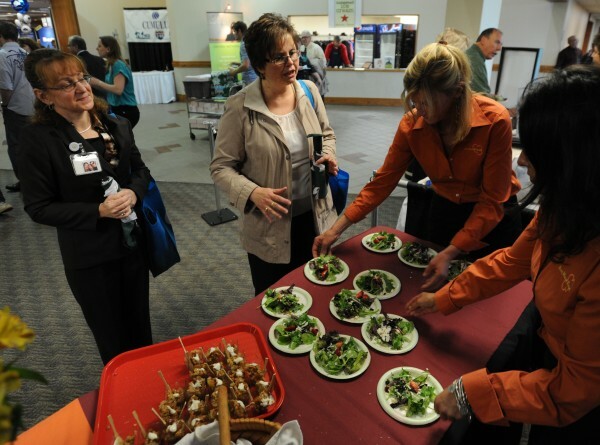 Michelle Ferm (left) and Paula Eaton (center) sample a salad made by Ann Marie Orr of Ann Marie's Kitchen at the Bangor Buisness Expo at the Bangor Civic Center on Thursday, May 10, 2012. Thursday's expo marks the first time food vendors and resturants were represented with food being offered to attendees. BANGOR, Maine — Businesses in Greater Bangor, many of which are just trying to survive in a struggling economy, don’t get many opportunities to network with one another. That’s why the annual Bangor Business Expo, hosted by the Bangor Region Chamber of Commerce, is so well-received, Chamber President John Porter said. “This is an opportunity for banks to mingle with marketing companies or telecom companies to talk with insurance providers. There are huge benefits to having these types of conversations,” Porter said Thursday. From 9 a.m. to 3 p.m. Thursday, the Bangor Civic Center was filled with booths and displays featuring an array of businesses in Greater Bangor. Each company got a chance to show off its goods and services and hear from experts in areas such as social media and Internet marketing. But mostly they got to rub elbows with each other. Jon Kunz, sales manager for Bangor Gas, stood beside a natural gas-powered car. Kunz said his firm has plans to build a natural gas pumping station in Bangor and he predicted that many natural gas vehicles would be on Maine roads in the coming years. In addition to showing off the natural gas car, Kunz was there to remind expo attendees that Bangor Gas continually is looking for new commercial and residential customers who want an alternative to oil. Tanya Pereira, an economic development specialist for the city of Bangor, said she sees herself as a saleswoman for the city. Businesses need to know that the city is there to help them and facilitate their growth, she said. Pereira shared booth space with Rob Jarvis, a golf pro at Bangor Municipal Golf Course, who set up a putting green and offered information about the city-run course. Elizabeth Sutherland of Sutherland-Weston Marketing & Communications said her firm is in high demand among companies looking to market their products or services to more people. She said in some ways, businesses can do more themselves with sites such as Facebook, but virtually every business is using social media, so it’s not a huge advantage. “I think people need to look at these sites as just another tool to help their business,” she said. Correction: An early version of this story misstated the reason a natural gas-powered car was at the Bangor Business Expo. Jon Kunz, marketing and sales manager for Bangor Gas, said the car was bought in Boston to add to the Bangor Gas fleet. It was not driven up from Boston specifically for the expo.